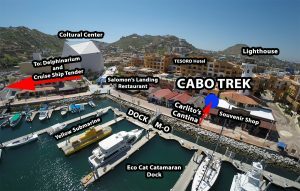 Cabo Trek has officially moved to a new location. 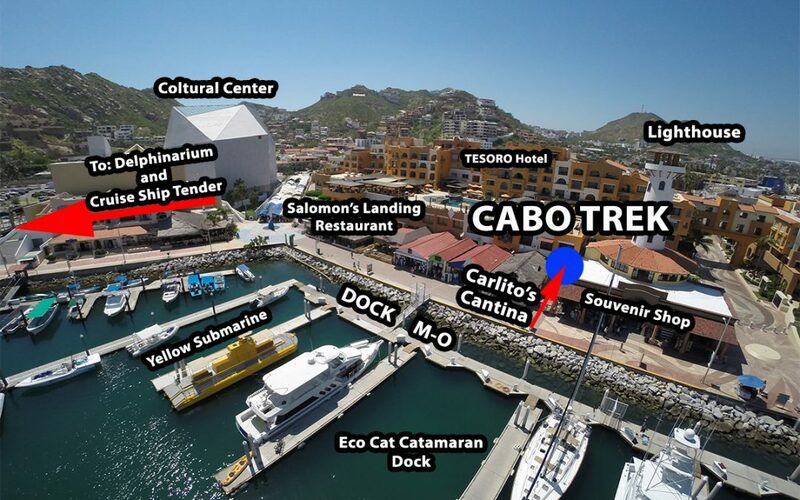 The shop is still located in the Tesoro Hotel complex in Cabo San Lucas, but now we are much closer to the Marina. When walking on the boardwalk where the dock M-O is on the other side of there is a restaurant called Carlito’s Cantina and a very big souvenir shop that has the form of a lighthouse, in between those 2 building there is a little passage that takes you to some public restrooms. Right behind the Carlito’s Cantina you’ll find a shop in the corner, it is the Calypso shop. We choose Calypso as this is the name of the boat Jeacques Cousteau used for his oceanographic researches, so we thought it perfectly fits in the picture: Cousteau defined the waters of Baja California Sur as the aquarium of the world for the incredible amount of different species of marine life found in the area and it goes along with the spirit and mission of Cabo Trek of discovering and exploring more and more about this incredible region. Blvd. Marine Lote 9, Local A-20, Colonia Centro, 23450 Cabo San Lucas, Baja California Sur, Mexico. Please contact us for information about our activities in Cabo!